Der Froschkönig oder der eiserne Heinrich (The Frog King, or Iron Henry) is the first tale in the Grimm Brothers’ collection of fairy- and folk-tales published in 1812 under the title Kinder- und Hausmärchen. The tale, one of the oldest in Germany, echoes themes from the story-telling traditions of many other cultures as well, of course, and continues to inspire writers and illustrators of children’s books today. It was a pleasure, therefore, to be asked by the Singapore publisher, Epigram, to translate Alain Chiche’s story, Le roi & la grenouille (The King and the Frog), in which the author’s gentle humour is complemented by Sylvain Diez’ beautiful illustrations. Every translator into English is aware of the howlers lurking in the subtleties of French diction and grammar, and the infamy and general disgrace attending missed, or worse, perhaps, mistaken linguistic, literary and cultural allusions. I was glad, therefore, to be able to draw on Vladimir Nabokov’s advice in his essay “The Art of Translation”. In it, he mentions three grades of evil in the world of verbal transmigration: ignorance and misguided knowledge; leaving out parts you don’t understand; and thinking you know better than the author. In trying to avoid them, I may have found a fourth: trying to avoid them. 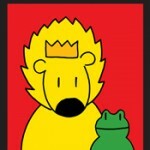 The King and the Frog was published in October, 2012 by Epigram Books. You can leaf through a facsimile of the first edition held at the Grimm Museum in Kassel, Hesse, here. An English translation of Der Froschkönig oder der eiserne Heinrich may be found here. Historical context and annotations are available at this website. Congratulations on being chosen for this project! Thanks, Jack. It was a pleasure to translate: poetic, classical, critical and funny. The funny part was the hardest. Beautiful play between text and illustration, too. Lucky children. If the parents get it. And who can doubt that?